VPSOs, and they’re pretty awesome. The Powersports team customized the four-door machines specifically to serve as police vehicles in our Arctic climate. They will replace older, two-door machines also purchased from KIC, currently in five region villages. Powersports’ talented (and Polaris-certified) mechanics Tom Dublin, Mike Hensley and Stephen Schaeffer did the modifications here in Kotzebue. In addition to the snow tracks, they installed in each machine a Lexan divider to separate the officer in front and prisoner in the rear, a handcuff bar in back and a lockable storage unit instead of the standard open bed. 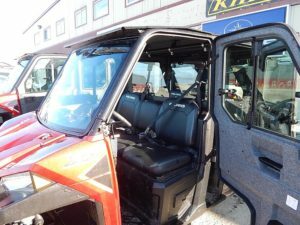 Northwest Arctic Borough requested the dimensions and options, then Powersports ordered it all, received it and did the custom work. Office Manager Lorlie Short coordinated not only ordering the machines from Polaris, but also a long list of custom parts from an East Coast company that specializes in outfitting police vehicles for off-road use. Northwest Arctic Borough VPSO Coordinator and Public Safety Director Chris Hatch tells us, “These features enable us to provide a higher level of safety for both our officers and prisoners. When we pick up a prisoner, we’re responsible for him or her and we need to keep them safe. In addition, the VPSO rogram doesn’t just provide law enforcement services. We also provide firefighting and EMS services. The three machines equipped with tracks will be shipped to Shugnak, Ambler and Noatak. Noorvik and Kiana will get the same vehicles, but with wheels year-round. The older machines the borough already owns will be moved into the communities of Kivalina, Buckland, Deering and Kobuk, where they will be stored in secure locations so they are available for use by VPSOs who visit in response to an incident. Placing equipment for future use in a community is essentially the same method the Alaska State Troopers use. The borough purchased the new machines with grants obtained in partnership with Maniilaq to help equip VPSOs in our communities. The borough anticipates needing to replace the machines in the next four to five years, and will look at planning for doing so during the next grant cycle. Thanks to the whole team at Arctic Circle Powersports.